A basic piece of gear – but rather hard to get by. We have it now in an enhanced design. Made from a high-quality 50/50 polyester-cotton blended fabric specially developed for the Pitchfork product line, the modern re-interpretation of the classic boonie jungle hat will become your trusted companion – no matter if in hot, cold or rainy conditions. The fabric has a technologically advanced "near infrared" (nIR) treatment to reduce the visual signature when viewed through a modern military night vision device. The properties of the camouflage pattern therefore remain intact in the dark, the material generally reflects light only very slightly. 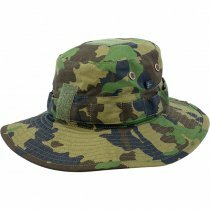 While keeping the classic shape of a boonie hat, the top is slightly slanted measuring 40mm high in the front and 50mm in the back. On the upper area a 25 x 25mm loop surface can be found to attach an IR reflective patch. On the front the 25 x 50mm Velcro piece is designed to hold the standard issue rank insignia of the Swiss Armed Forces. On the sides eyelets for air circulation can be found: Small enough to keep rain out, large enough to ensure basic ventilation. Around the hat we used the same polyester-cotton material instead of stiff webbing ensuring an all-around low IR signature. Hidden underneath the circumference a shock cord is sewn in that allows infinitely variable size adjustment for a perfect fit, keeping the selected size by a cord stopper in the back. The brim is slightly less wide than usual. Just right as we find. All other features found on standard models like the chin strap or a neck cover have been left out - Functionality thru simplicity. The Pitchfork Boonie Hat is available in S/M (7-7 ¼ inch / 55-58cm) and L/XL (7 ½-7 ¾ inch / 59-62cm).